Obviously, the Doha summit did not discuss cement price rises or production shortages in the Arab world. Nor did it dwell on the Arabs’ growing demand for wheat that their vast arable lands -- including the water-rich ones -- fail to meet. The summit, as usual, considered the pan-Arab nation’s “fateful issues at this critical juncture,” chiefly the current Syria crisis. It would have been useful if someone had wondered out loud, “Who will rebuild Syria? “Can the output of Arab cement factories meet demand? Therein lies the importance of discussing the subject of cement and wheat in the Arab world. It might sound odd to ask, “Who will build the New Syria?” when the Arabs have yet to find a way of stopping the destruction of Old Syria and the killings in it. We better wise up, harden our hearts, ponder unemotionally and set up committees to address these issues. A group of about 45 Syrians representing all hues of the Syrian opposition, including former officials who deserted the regime, last year set up “The Day After” workshop in Berlin in association with two institutes – one German (SWP) and another American (USIP). They did wonderful work in planning what to do in post-Assad Syria. They outlined the roadmap to a peaceful transition to democracy, the rule of law and security, constitution making, economic recovery and reconstruction (see Syria and “The Day After” Project for full details). But of course “The Day After” workshop did not discuss the issue of cement, of which Old Syria produced not more than six million tons annually. Only God knows how many months it would take Syria’s cement plants to resume production. The Arab world’s top cement producer is Egypt, with an annual output of 48 million tons. Saudi Arabia comes next with 42 million tons a year. 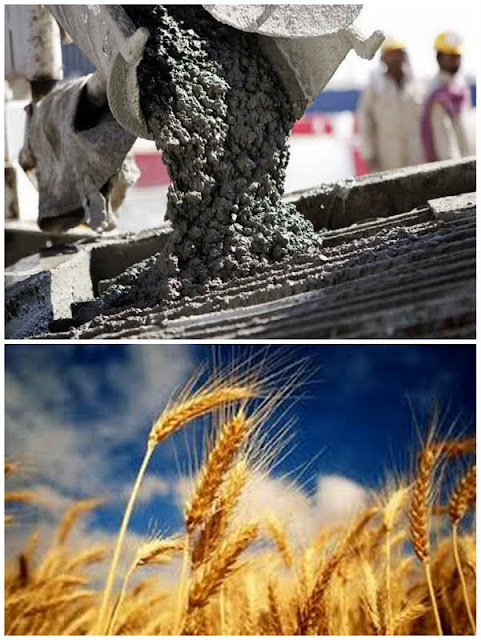 Although both countries try to expand their respective production capacities, their cement prices keep cropping up because of increasing demand for housing units in each. Most probably local demand for Saudi cement will heat up after the Kingdom issued final regulations on real estate financing, leasing and the supervision of financial companies as it tries to ease a housing shortage by opening up its mortgage market and enacting the first home-loans law. So who will supply cement for the Syrians if the Saudis ban exporting their cement and the Egyptians need every bit of theirs? And who will finance Syria’s reconstruction in the first place? Syria, after all, is unlike Libya, which was also ravaged by war. But oil-rich Libya has the cash. Syria’s oil production is wanting, save for 300,000 barrels per day, part of which is exported with the revenue going to the coffers of President Bashar al-Assad and his relatives. Moreover, destruction in Libya pales in comparison to Syria’s devastation. Will Turkish and Saudi concerns rush to invest in the New Syria, or will the huge offshore funds held by Syrians solve the problem? And before wondering about Syria’s prospective cement suppliers, Syrians need much time to rebuild their state institutions, draft a constitution and organize elections. Wheat is another Arab collective concern. Saudi Arabia, for instance, will scrap wheat growing in 2015 after absurd consumption exhausted its future generations’ non-renewable groundwater resources. The Kingdom does not need more than three million tons of wheat a year and has all the cash to import it from Russia or Australia. But Egypt produces only half of its annual consumption of 19 million tons at a time when its net foreign currency reserves are down to $13.5 billion, barely enough to cover three months of its imports of essential goods and oil. Also, unlike Saudi Arabia, Egypt did not build grain silos, which means storage costs are added on to its wheat prices. Theoretically, the solution for all Arabs is in their fertile lands in Iraq, Syria, Sudan and Algeria. Politics, however, prompted Saudi Arabia to try leasing Russian farmland to grow wheat through private companies it controls. The kingdom overlooked Algeria, whose military are far from being amenable to negotiations. After its revolution, Egypt discovered Sudan to its south, where it plans cultivating about one million feddan (or 420,000 hectares) in the long term, once its politicians stop squabbling over the country’s Attorney General and other petty issues. I used the metaphor of “cement and wheat” to highlight the interconnection of Arabs. Despite borders keeping us apart, our disparate customs duties, one country like Saudi Arabia supporting the cement industry and another like Egypt choosing not to, the Saudis having the experience and money to grow wheat and the Sudanese having the land, water and workforce… we are all prone to be affected by economic changes elsewhere. The reference is chiefly to changes affecting essential commodities, such as iron, cement, wheat and fertilizers – all of which have internationally-quoted prices. We ought to accelerate Arab economic unity plans, bring down trade barriers and focus on the economy and quality of life, which are the mainstays of the Arab Spring. Had we helped Egypt tackle the economy before plunging into politics head on, Egypt would not have been suffocating in a seemingly open-ended political crisis. Egypt could have done without its ridiculous cycle of protests and counter-protests, charges and counter-charges, and blows and counter-blows – all leading to the erosion of all human values, including the Egyptian citizen’s dignity. Syria, where the revolution has yet to triumph, is also in the throes of accusations and counter-accusations with the media already evoking the strife in Egypt in order to guard against a replay of the Muslim Brotherhood’s role in the Syrian revolution. Better wait for the Syrian revolution to prevail before taking on the Muslim Brotherhood. Any cause for optimism in all this? Yes, when “cement and wheat” top the Arab politician’s priorities.